This is the other set of cards we are making in my classes this week. 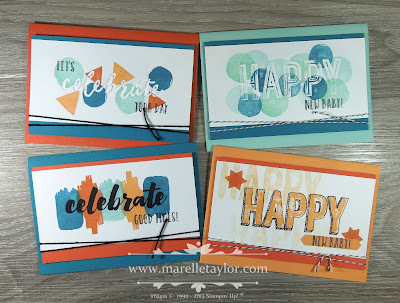 We are using the Happy Celebrations stamp set, and co-ordinating embossing folders. These cards would also make a lovely Christmas Gift, packaged into the C6 Acetate Boxes. I love a stamp set with bold words and patterns. It means that you don't have to work very hard to make creative designs! My colour scheme is Island Indigo, Pool Party, Tangerine Tango, Peekaboo Peach and Basic Black. TIP: the triangle stamps make a cute little star when you stamp it twice in opposite directions!